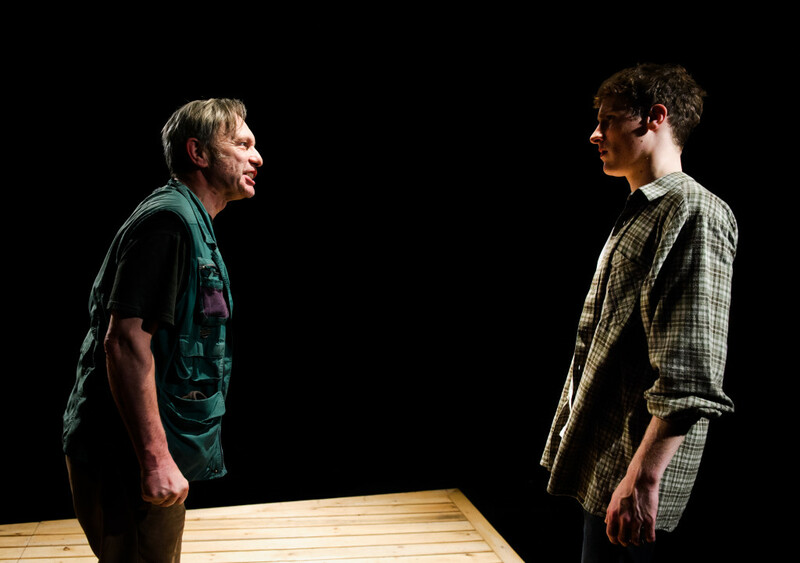 Daniel Foxsmith’s new play gives up plot in the pursuit of character relationships, and unfortunately the two are more connected than one would like to think. Weald, presented by Snuff Box Theatre, simultaneously generates decent insights into a forgotten lifestyle while having little to make of narrative tension. The two-hander concerns Jim, a mid-twenties runaway who returns to his farm home in Northern England in search of work. Sam, the venerable owner and friend of Jim’s late father begrudges him a job. The two coalesce into a surrogate father-son relationship, though one which evidently will not avoid its share of adversity. Foxsmith creates subtle contrasts that bring a more delicate form of conflict. The clash of burgeoning life to oncoming death, the allure of the city to the morbidity of the country and the nobility of history to the ineluctable present drive the almost plotless play. The difficulty in Foxsmith’s script is that it wants Jim and Sam to grow into richer presences and yet cannot do so without the dynamic agent of story. Ultimately, if Weald had more structure then it could accomplish its dramatic objectives and therefore ascertain some answers to its own questions. However, there is a bare plot, and what there is of it occurs in the play’s final twenty minutes. Jim joins the farm and considers leaving again for London; Sam does not appear to have any objective bar that of avoiding the continual ringing of the phone that hangs on his wall. With few goals, the most sympathy the play can hope for rests on its repartee and the actors who deliver it, which notably works for half of the scenes. If Foxsmith had aimed for Beckett and obviated story he could have made a play of pure atmosphere. Instead, the half-formed plot hampers a full development of character and tone. Even with the slight defects of writing, the cast and crew produce a respectable eighty minutes of close-up theatre. Christopher Hone’s set is at once homely and perceptibly functional, displaying the dual nature of the protagonists’ relationships. Tools hang on the back wall, each having their use in the vigorous interstitials constructed by director Bryony Shanahan. A special commendation should be made to lighting designer Seth Rook Williams for his manipulation of light above and under the floorboards of Hone’s stage, used to capture the invisible corporeality of a horse that the characters are forced to put down. Regarding the cast, David Crellin as Sam is a marvel: his uncanny ability to turn from casual joy to sudden fury is incredible, more so when he is called upon to undergo an seemingly impossible transformation in the show’s climax. Opposite, Dan Parr is less strong, often failing to deliver the requisite goodwill and enthusiasm that his role demands of him, although he too is quite capable of realistic outrage. While unfocused, Weald shows Foxsmith’s knack for forming character and organising conflict, even if he does not complete both of these tasks to the fullest degree.